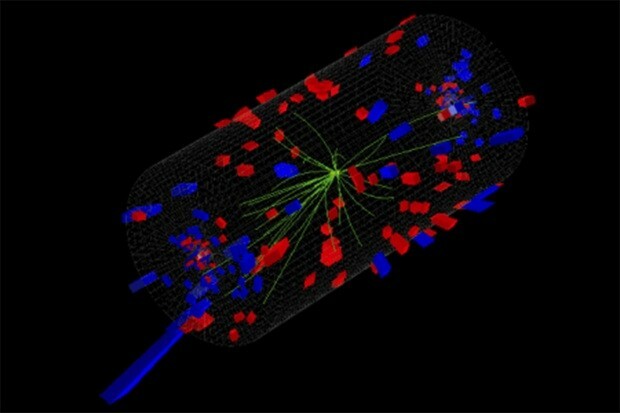 Teams at the Large Hadron Collider must be developing a knack for producing tangible evidence of theoretical particles. After orchestrating 2 million collisions between lead nuclei and protons, like the sort you see above, the collider's Compact Muon Solenoid group and researchers at MIT suspect that stray, linked pairs of gluon particles in the mix were signs of color-glass condensate, a currently theory-only form of matter that sees gluons travel in liquid-like, quantum-entangled waves. The clues aren't definitive, but they were also caught unexpectedly as part of a more routine collision run; the team is curious enough that it's looking for more evidence during weeks of similar tests in January. Any conclusive proof of the condensate would have an impact both on how we understand particle production in collisions as well as the ways gluons and quarks are arranged inside protons. If so, the CMS and MIT teams may well answer a raft of questions about subatomic physics while further justifying CERN's giant underground rings.